Today my spinning sister Lori, who has her own inspiring blog at walkingwool.blogspot.com, sent information about Ghandi and spinning in a comment to my blog about creating our own peace. I knew that Ghandi spun cotton on a charkha. A charkha is a unique type of wheel that spins very fast which is what is required to spin the short cotton fibers. I knew he said everyone should spin at least a half hour a day because of the inner peace it provides and he advocated that people in India spin as a form of rebellion against England. If they could create their own cloth they would not be dependent upon England for these goods. Women did this in America before and during the Revolution to reduce dependence on England. (I am not picking on England 🙂 I have been there twice and remember the first time I arrived feeling that I had come home. I love it.) It is just history. His ideas are so beautiful and powerful. I felt emotional when I read the line “For every revolution of the wheel spins peace, goodwill and love.” As I have said before, I think every spinner feels this each time he/she spins. It may be inner peace, or greater, but we feel it. This particularly resonates with me as I sit here watching the Boston Marathon on tv. I don’t need to comment specifically about the horror of the bombing two years ago, or the recent trial, but instead am thinking about two images that brought me some peace in the wake of it. First was seeing on tv that very soon after the Marathon there was a baseball game played by the Yankees, the arch enemy of the Boston Red Sox. I truly don’t understand the extent to which some fans on both sides take their dislike of each other. At this game, and it still chokes me up a bit, the Yankee fans started singing Sweet Caroline by Neil Diamond. For some other reason I don’t understand, that song has become the song of the Red Sox and is sung at every game. For Yankees fans to show that form of unique support when Boston was reeling was a surprise and felt wonderful. Secondly was the end of the Marathon last year. TV coverage went off at 4:00 and I was watching because a friend, who was stopped the year before one mile before the finish line, was running to complete it for his first time. I didn’t think I would pick him out but had to watch. What we saw was wave after wave after wave of runners approaching the finish line in the sunlight. Again I feel choked up as I remember thinking “This is the way it is supposed to be.” It is supposed to be a fun, traditional event. It is supposed to be an event that parents can take children and feel safe to cheer on runners and watch for their family members and friends cross the line after 6 hours (!) of running. Last year it was again and I believe will be the same this year. Coincidentally, although I know people who don’t think anything is a coincidence and maybe this isn’t, a few days ago purchase I made from The Woolery http://www.woolery.com, a wonderful spinning and weaving store, arrived. 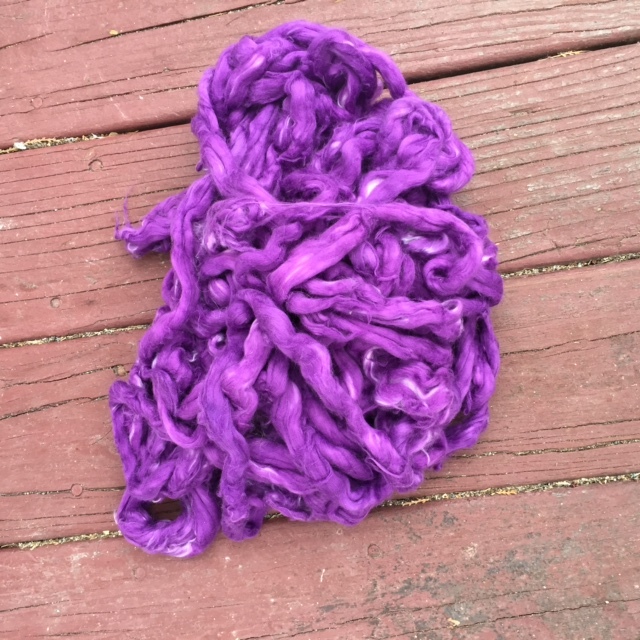 I have been thinking about spinning cotton, and have dyed some that I threw in when dyeing lace for the ring bearer’s pillow for a friend’s daughter’s wedding over a year ago. 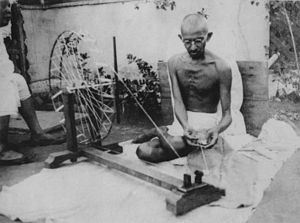 When I read up on spinning cotton I realized that my wheel would not spin quickly enough which is why Ghandi used a charka which can . Cotton can also be spun on a drop spindle that twirls quickly so I decided to get one. 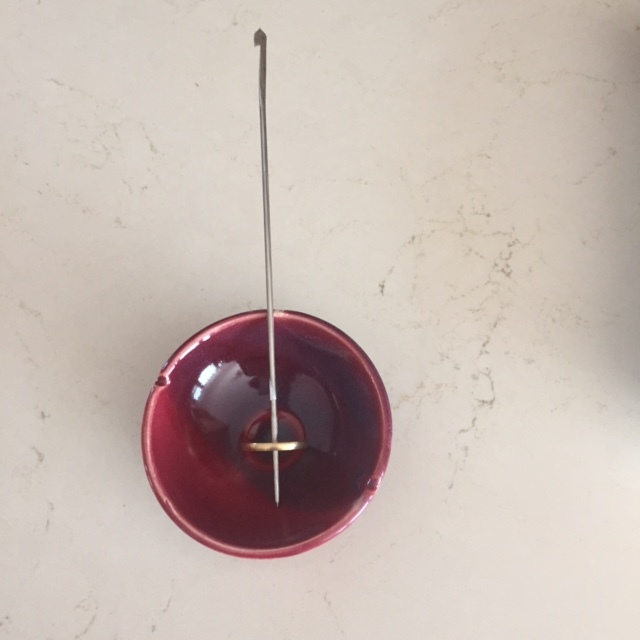 My tahkli spindle arrived with a little bowl in which it will sit as I spin. It weighs half an ounce and is 7″ long. 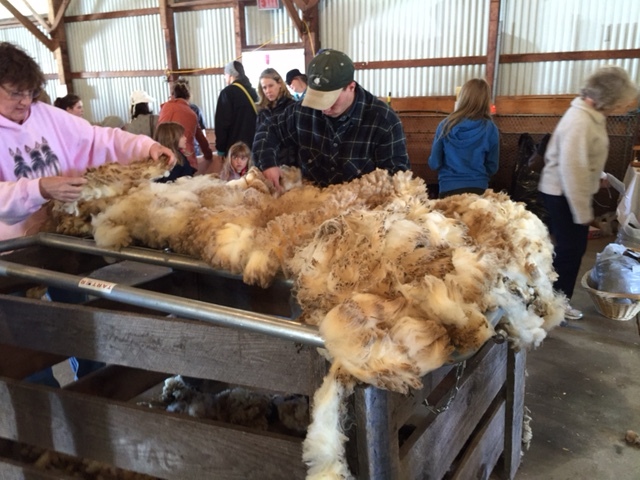 I want to spin and then weave the cotton into dishcloths. Of course first I have to learn to card and spin cotton and how to use this spindle, but I guess the signs point to my learning it now. I will start today. My challenge will be to feel peaceful as I practice with it and fail and fail at first until I get it down. I guess this is part of persistence towards peace on any level even this teeny. 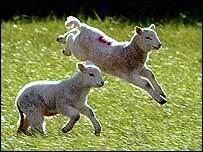 I didn’t plan to be quite so somber for this week’s post but it felt right as I wrote so I will leave with some pictures of lambs frolicking. Who can’t smile and feel good when they see crazy lamb behavior. Or even just lambs sitting and looking darling. I’ll go card cotton but cotton bolls just aren’t as cute as lambs no matter what the bolls are doing. 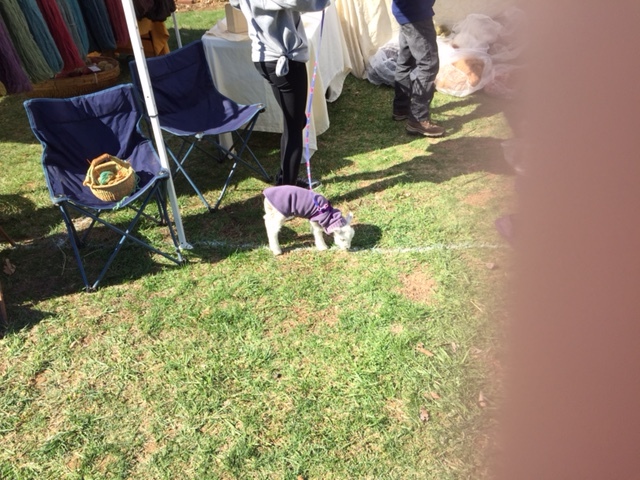 This entry was posted in Uncategorized and tagged charkha, cotton, cotton spinning, Ghandi, Ghandi spinning, hand dyed cotton, hand spinning, lambs, peace, peace with cotton spinning, tahkli spindle on April 20, 2015 by Betsy Alspach.